Technically we had 24 hours to leave French Polynesia from the time we walked out of the Gendarmarie’s office in Bora Bora. As we spent the night still in Bora Bora, that meant we had till lunch time to depart the country. There is a problem with this, Maupiti was on our way out and it had a great reputation of being more like the Tuamotu islands, a pristine, undeveloped atoll with a lagoon. Maupiti is just 30nm west of Bora Bora. We decided that we would run the gauntlet and pay it a visit for at least a night before we left. 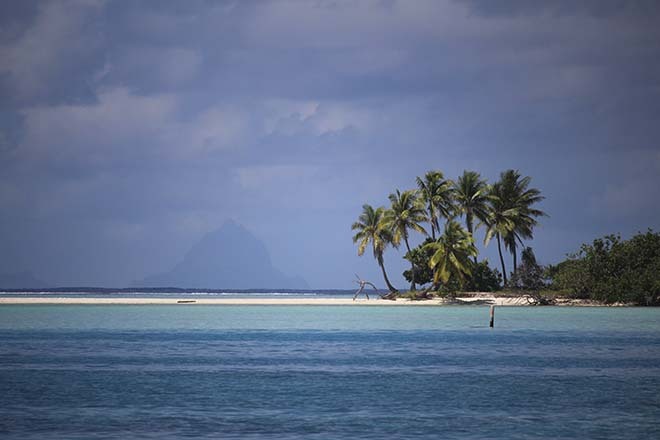 We took off from Bora Bora at sun up and motor sailed across to Maupiti, arriving at lunch time. As you enter the lagoon you can see that the water quality is far better than Bora Bora. The beaches are beautiful and there are no big resorts. It really is a pretty place. As you come through the pass, it is narrow and good surf on both sides. It is pretty easy to transit though and the leads take you all the way into town. Just past the little island on the left of the pass, the channel turns across to the west and there are several yellow marker buoys. We thought these were moorings but we’ll get back to this shortly. We steamed up into town and found a couple of yachts anchored out the front. As we passed one we spoke to them and found that everything was closed being Easter Monday. We asked where the Manta Ray cleaning station was, as this is one of the highlights of this place. We were told it was back at the yellow markers at the entrance, so we cruised back to that area, found an actual mooring and had a bite to eat. Secure in 9m of water, you could clearly see the bottom and needless to say, it didn’t take us long to jump in the water. 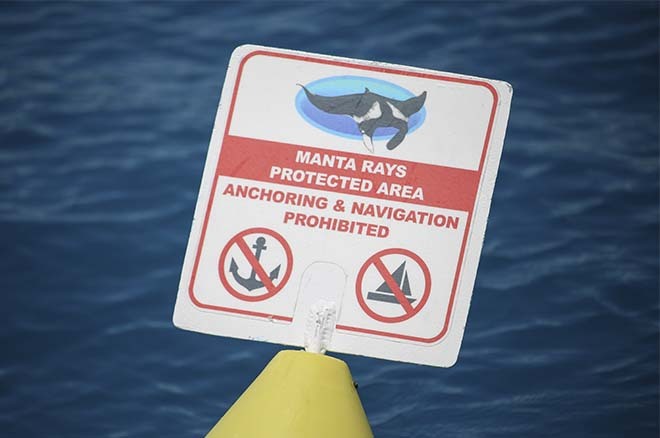 Over to the east you could see three yellow buoys that had signs clearly stating that you are not to anchor in or transit through the area as it was a manta ray preservation area. It was fantastic to see that they cared enough to close off an area, even though we thought it could have been far bigger. If you have been following our crusades you will recall I have an issue with super yachts that don’t have the courtesy to think of other water users. So you could imagine what I thought of a 130ft superyacht that anchored so close to the manta ray protection area, his stern was actually in the area. Why he had to be so close I will never understand. I guess his guests where more important than the manta rays. After a quick swim we threw on some snorkeling gear and went over to the area. 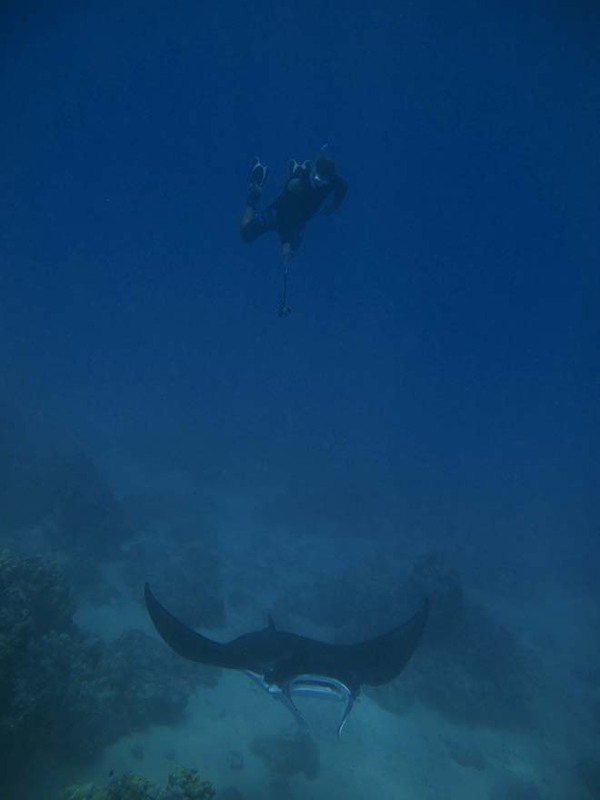 It didn’t take long and we found a manta ray swimming over a bunch of coral. It wasn’t in the protected area, it was actually to the west, right where the chain of the superyacht was. If you are unaware as to what a cleaning station is, it is a place where the manta rays can go and small fish and remoras will clean their skin from parasites and even have their mouths cleaned. Rather than swim along and disappear before you get good photos or footage, they simply swim around slowly over one spot and it is perfect for us to see them. The one we got to see was beautiful, one of the most majestic creatures you will ever see. However something was missing…..his tail. Not sure what had happened, but sure enough this guy was a bit munched in the tail area. We swam with him for 10-15 minutes diving down to his level. Eventually he had enough and swam off, maybe he was clean. We jumped back in our tender and cruised around the area looking for more. We found two eagle rays and jumped in with them for a quick 5 minutes before cruising back to the yacht. Then our trip in paradise turned for the worse. Through the pass appeared Vantage, the superyacht that we had issues with in Huahine not that long before. I instantly got that feeling that this was not going to turn out well. We thought that at least he wouldn’t anchor where the other superyacht was but that changed as the initial superyacht started hauling his chain. Vantage was sitting over to the side just drifting. Once the first yacht disappeared we heard the sound of Ad-vantage coming through the leads. It was incredibly noisy, not sure what they were running. Well wouldn’t you know it, they anchored right next to the Manta Ray protection zone. I just happened to be in the water giving our hull a once over and could hear the anchor chain, the bow thrusters and the engines. It was horrible being under water and we were 500m away. These guys were right on the boundary of the manta ray protection zone. If I was a manta ray, or any animal for that matter, I would be out of there in a flash. They anchor and their stern is in the zone. Then Vantage comes and rafts up next to them and their stern is further into the zone. Next they are out with jetski’s and power boats, launching them in the zone and cruising through the zone. The locals appeared and one boat got really angry with them. Others just sat and stared at the overwhelming wealth, money that could probably buy the island. I got out of the water really angry. I couldn’t believe the arrogance on these people. How can someone have so little respect for the ocean, yet that is what they have come to see. There was so much ocean for them to anchor in, even places that weren’t in the way of our sunset. Their anchor would certainly be through areas where manta rays get cleaned and the size of their chain would rip out corals and destroy habitats in a flash. Here we were in a perfect piece of paradise, we had seen one of the most majestic creatures in the ocean in all his beauty and it was totally wrecked by rich arrogant idiots. I checked the weather for our trip to Niue. We had planned to leave the next morning. With a new forecast it actually was better to leave immediately. We knew that we would have 24-36 hours of steaming to get to the winds but if we left the following day it would extend that period. Being upset at the status of the superyacht, we opted to leave rather than enjoy a beautiful sunset in paradise. Whilst listening to the generators and engine fans of the superyachts. 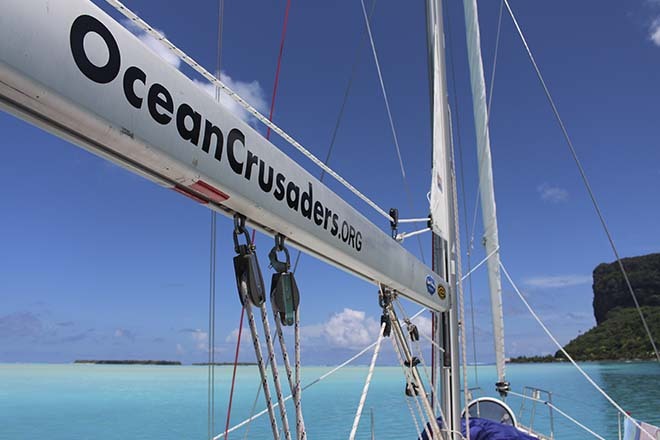 So we dropped the mooring and set off at 1600 on our journey, 760nm to Niue, a little coral island in the Pacific. We really want to get back to Maupiti, it was beautiful. Hopefully next time we will have it with other people who respect our oceans. Anchoring a superyacht in coral grounds where manta rays get cleaned, that is just plain stupid, I don’t care who you are. 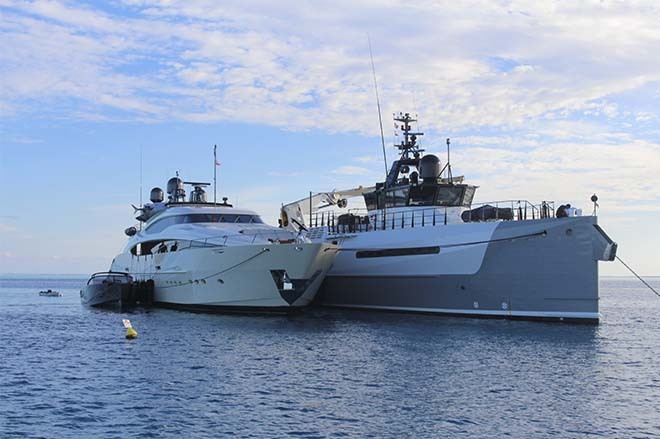 Even a normal yacht does not need to be that close. We will certainly be contacting the French Polynesian government with the images in the article. They need to expand that area and ban anchoring by installing additional moorings, even ones suitable for superyachts. That way the area will be protected. It is the only way, otherwise the manta rays will move out, like they did in Bora Bora. 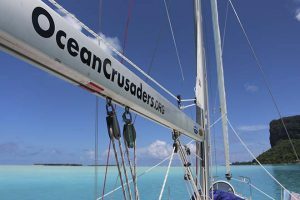 Stay tuned for our next edition as we sail to Niue and explore the coral island known as ‘The Rock’. Oh by the way, we nailed a Blue Fin tuna just 50nm from Maupiti. Beautiful.